This festival is held annually at Ober Gatlinburg, this year it is from September 21st through October 28th. It offers a wide array of activities, food, and entertainment. Treat yourself to German fare and beer, as there is plenty of it. You’ll find brats, Wienerschnitzel, and delectable German chocolate cake. The Bavarian Fun Makers Oompah Band will make you want to dance to traditional folk dances, but you are more than welcome to sit back and watch as you enjoy a beer. Specialty draft beers include several Oktoberfest varieties, Warsteiner, Frankensteiner, and Spaten. Grab a beer card (if you’re 21 or older with a valid ID) and get either four 16oz beers or eight 7oz beers. They even have “das boot,” an approximately 24-ounce boot of beer for $14.95 (and refills are only $7). While at Ober Gatlinburg, make sure you check out the other activities they have to offer. Not sure what they are? Check out their brochure or one of our previous blog posts. In years past, this festival stopped short of Winterfest at the close of the annual Chili Cookoff, but now you can enjoy both at the same time! Winterfest begins on November 5th, but the Smoky Mountain Harvest Festival keeps going until November 25th. Can you imagine a better way to spend the Thanksgiving holidays than with beautiful lights and fantastic seasonal decorations? If you want to capitalize on the beautiful color-rich mountains, then mid to late October is the time you should be snapping photos. Also held during the Smoky Mountain Harvest Festival is the annual Gatlinburg Craftsmen’s Fair (from October 4th through October 21st). Not only will you be able to shop from wares created by local artisans, but also the top craftspeople from the nation. Held at Rocky Top Sports World, the Thanksviging Bowl is in its 47th year. Spend your 2018 Thanksgiving while watching one of the games in the three-day tournament (November 21st through the 24th). Youth football teams will be participating along with their cheerleaders. If you can’t make this event, that’s okay. Rocky Top Sports World has numerous other activities with events happening throughout the year. 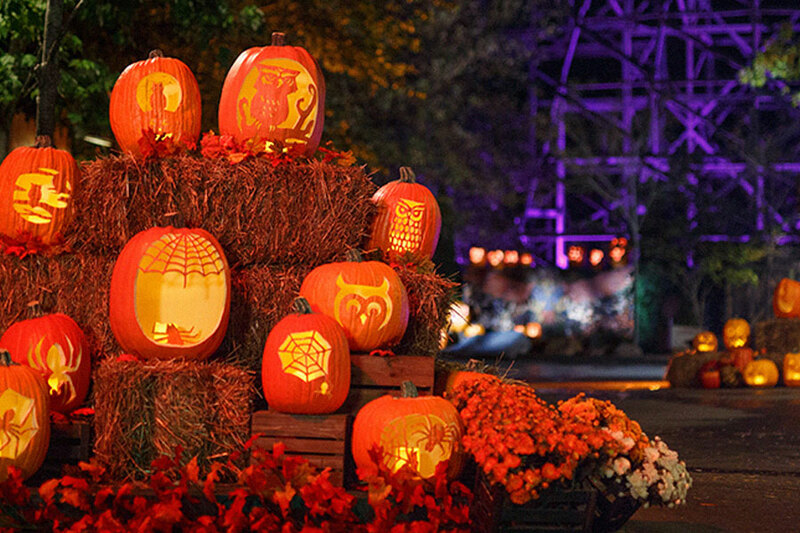 Dollywood is decorated beautifully during their harvest festival that is held through November 3rd. They have a stunning light display called Great Pumpkin LumiNights with sculptures, scenes, at least 12,000 pumpkins, and thousands of lit jack-o-lanterns. If you’ve been in years past, make a note to come again this year. They have more than doubled the size from last year! You can also enjoy the Southern Gospel Jubilee during Harvest Festival. Access to wonderful music coming from Southern Gospel Jubilee, the largest celebration in the world dedicated to Southern Gospel, is included with your admission. Check out handmade crafts from on-site craftsmen and artisans, and take in your fill from seasonal foods like candied apples and pumpkin-flavored treats. If you plan to visit, consider a multi-day pass, which can save you a lot of money! They’re valid for up to five days after your first use, so you can break up the park between other fun activities or festivals. This festival in Townsend highlights the best in whiskey and gourmet food, for those age 21 or over. The festival is held on November 2nd and 3rd from 6 p.m. until 9 p.m. Your admission provides access to whiskey tasting and food sampling, entertainment, and exclusive face-to-face meet and greets with your favorite distillers and restauranteurs. It’s like a pub crawl without any driving! Entertainers like January Noise set the stage for a night to remember. That’s it for our list! To get some family photos with a harvest backdrop, check out The Island in Pigeon Forge and Anakeesta in Gatlinburg. Anakeesta also will offer some beautiful shots of the mountains in autumn, and you can pick up pumpkin pie at Pearl’s Pie in the Sky for a treat while you visit. OBER GATLINBURG IS MORE THAN SKIING AND SNOWBOARDING – IT’S A MOUNTAIN OF FUN FOR THE WHOLE FAMILY! Ober isn’t just fun and games, it’s food and shopping too! Try some of our homemade fudge from the Fudge Shoppe and get that perfect gift to take home.